Current window technology is focused on meeting ENERGY STAR criteria (U ~0.30, SHGC <0.30) and is commonly achieved by double glazed windows with an argon gas fill and a single low-e coating. Increasing the insulating (R) value of windows, while dynamically optimizing solar gain, has the long-term potential to eliminate this energy drain. The ideal residential window will have very low heat loss year round, collect passive solar energy in the winter and reject solar gain in summer, while allowing daylight and view as desired. The technology proposed in this project will result in windows with wide range of SHGCs (0.18 – 0.45). The windows will have onboard intelligence to determine the optimal SHGC by varying the shading position. We aim to create a flexible technology platform for cost effective, high performance residential windows that maximizes net useful solar gain in heating mode and minimizes solar gain in cooling mode. Fully automated operation to optimize energy savings is provided by an intelligent, networkable, sensor/microprocessor package that is easily installed and calibrated. The windows are designed to minimize annual energy use in cold and mixed climates (i.e. Minneapolis and Washington DC). About twenty-five windows will be fabricated and installed in a cold climate houses to demonstrate both peak load reduction and annual heating and cooling energy reduction. The windows will be able to function autonomously and in a networked configuration. In a networked configuration they will communicate with each other. We are also working with code officials, utilities, and industry stakeholders to ensure proper credit of smart dynamic windows in future code cycles. In this project we define the properties necessary for windows to have zero impact on the energy use in a typical house (i.e. a Zero Energy Window). 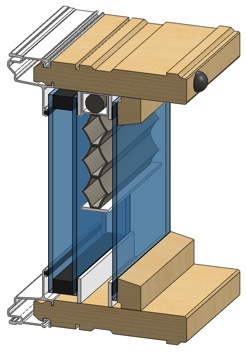 Highly insulating window development efforts often focus on the development of an insulating glass unit with center-of-glass U-factors of 0.10 Btu/hr-ft2-F (0.57 W/m2-K), a target which can be achieved with three layers of glass, two low-e coatings and a low-conductivity gas fill. Vacuum units and aerogel are other alternatives under R&D. Spacer and frame effects can be expected to degrade this performance; as such a total window U-factor of 0.12 Btu/hr-ft2-F (0.68 W/m2-K) is targeted as being a realistic long-term product for ZEHs. While there is clear data from prior studies that lower U-factor windows are needed for ZEHs throughout the central and northern US, the question of an optimal SHGC, particularly in climates with some cooling load, deserves significant attention. As such, our analysis focuses on looking at the impacts of a typical window's SHGC as well as on the potentials from windows with dynamic SHGC (i.e. a SHGC which is reduced in the summer). This SHGC reduction can come from the use of a mechanized shading device or from an active glazing (i.e. an electrochromic glass). A summer SHGC of 0.16 was picked as representative of a window with a reduced summer SHGC; such a value allows for the design of a window that can offer a reasonable view (visible transmittance of glass greater than 0.30) but will make a serious reduction in solar gains. For zero-energy homes to become a reality, it is desirable that windows provide a net source of energy, to the extent that this is practical in various climates. Admitting solar heat gain during the heating season to reduce the need for furnace operation is the only means for improving upon the energy consumption calculated for the baseline windowless house. However, the solar gains associated with the windows during the cooling season must not outweigh the energy saved on heating and the thermal conductance of the windows must be low enough to reduce the thermal losses to less than the solar gains. Daylight admitted through windows minimally reduces the consumption of energy for lighting but is not considered here since most residential lighting needs are at night and this effect is minor. In a city with large heating loads (Ex. Minneapolis) it is clear that products typical of today's Energy Star level (#3,#4) are far from the zero energy use line. A product that represents today's best available technology (#5) (which exceeds the Energy Star standards) is significantly closer to the zero energy use line, but not quite there. Improving on this window's U-factor significantly, such as window #6, brings this product nearly to the zero energy use line. Dynamic windows offer the potential for the windows to transmit solar radiation when it is useful (the heating season) and to minimize solar transmission during the cooling season—potentially becoming energy gainers (Arasteh 2006). To take full advantage of dynamic windows an automated shade algorithm is developed. Fully automated operation to optimize energy savings in the context of other market drivers is provided by an intelligent, networkable, sensor/microprocessor package that is easily installed and calibrated. The control algorithm can be implemented inside the window or on a home automation microprocessor. It only requires a few input values from local sensors integrated in the window to determine the optimal shading operation. 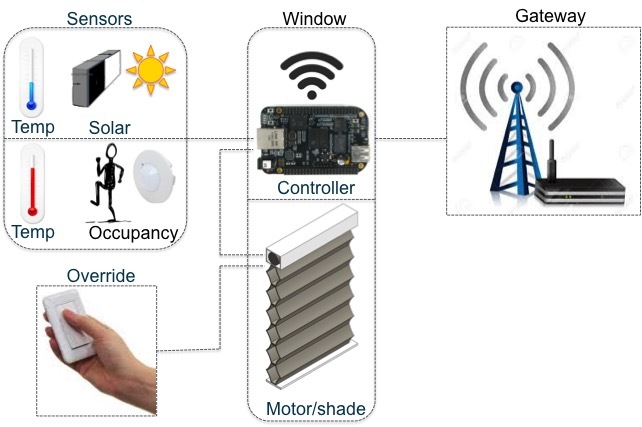 Four sensing types are integrated into the window; Motion sensor, exterior temperature, interior temperature, and solar radiation heat gain. The intent of the motion sensor is to determine when an occupant is home, or near the window, and therefore remain in a manual override state if placed into one. The remaining three sensors are utilized to determine the direction of net heat flow through the window. With knowledge of the heat flow, we develop a control algorithm to put the shade into the most energy efficient position. Where Uwindow is a property of the window itself, which varies depending on the shade state. Text, and Tin are read from the integrated window sensors. SHG is the product of SHGC and incident radiation. Because SHGC is highly dependent on solar incident angle we instead measure total solar gain through the system. This net heat flow equation is very useful because it directly looks at the conditions local to the window, and evaluates how to optimize the local net heat flow (Firląg 2015). Sensor accuracy was tested extensively in the field. One major out come of this testing was the development of a solar sensor to more accurately represent actual solar intensity. The steps taken to determine the accuracy of the BW solar sensor are outlined in Dussault 2015. In order to understand user response to the system, and how it is operated in the real world, we have identified several homeowners to participate in a demonstration project. Participants were selected from a pool of volunteers who have recently purchased Pella Designer series windows with Insynctive technology. Additional considerations include typical climate of home location, exterior conditions such as shading from neighboring houses, orientation, and quantity of windows in the home. As part of the study, several windows in a participant's home are temporarily retrofitted (for the duration of the study) with an automated shading system and associated sensors and controls. Sensors will include window mounted interior and exterior temperature readings, solar intensity, and an occupancy sensor. The windows will wirelessly transmit the position of the shade (open/closed) to a dedicated router in the home that will transmit this information to the researchers via cellular connection. All experimental data will be recorded anonymously. At the completion of the study participants will be asked to complete a short survey regarding their experience with the system. The survey responses will be used to inform researches on user acceptance, potential design modifications, and market for the technology. The automated shading system and associated components will be removed from participant homes and windows will be returned to their original state before the project is concluded. A key functional characteristic of the automated window is that its thermal/solar optical properties can change over a wide range to manage energy and comfort. The project team is addressing numerous design and technical issues related to how users can benefit from this "smart product", both in a stand-alone mode as well as part of home automation systems. However, the potential market impact also depends on how other decision makers interpret and accept these performance potentials: building codes and standards, voluntary rating programs like Energy Star or LEED, utility rebate programs, etc. We live in a world that is largely defined by static properties of products that are easily measureable, e.g. 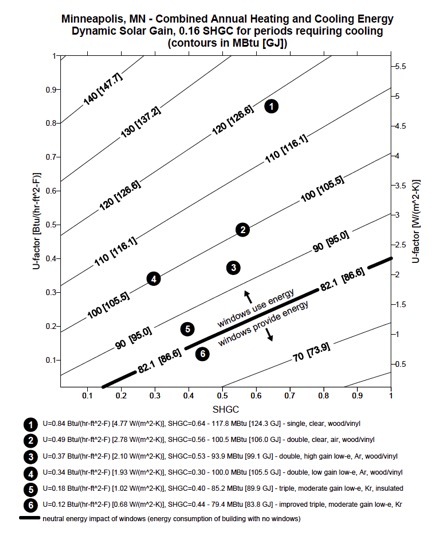 a maximum .3 SHGC (as specified by NFRC) is needed by a window to meet a building code, but modeling and field tests show that a window whose SHGC can vary from .15 to .40 will have lower energy use in summer and winter than the window with fixed properties. How do we give appropriate annual energy credit for such a product? How sensitive are energy savings to control sequences? Can the control actions be "guaranteed"? Can a smart window have even more value for demand response and peak load management? What happens when the controls are overridden? How sensitive are these questions to climate and orientation? How does an inspector verify the required properties? What risks are there for all the stakeholders? To address these and related issues we have formed an Advisory Committee to help address market readiness issues such as code compliance, performance rating, connection with home automation systems and feasibility for builders to incorporate "smart windows" in their plans. The committee will initially focus on the needs of this DOE/LBNL/Pella Smart Window project but will be broad enough in scope to support other existing ( e.g. electrochromic glass) and future DOE smart window efforts. Note that DOE is funding a new effort with the Attachment Energy Rating Council to "rate" the performance of dynamic window systems. The AERC will use new tools developed by LBNL for this purpose but ratings wont be available for several years. Dariush Arasteh, Howdy Goudey, Yu Joe Huang, Christian Kohler, and Robin Mitchell. "Performance Criteria for Residential Zero Energy Windows." In 2007 ASHRAE Winter Meeting. Dallas, TX, 2006. Szymon Firląg, Mehrangiz Yazdanian, Charlie Curcija, Christian Kohler, Simon Vidanovic, Robert Hart, Stephen Czarnecki, "Control algorithms for dynamic windows for residential buildings," Energy and Buildings, Volume 109, 15 December 2015, Pages 157-173. Jean-Michel Dussault, Christian Kohler, Howdy Goudey, Robert Hart, Louis Gosselin, Stephen E. Selkowitz, "Development and assessment of a low cost sensor for solar heat flux measurements in buildings," Solar Energy, Volume 122, December 2015, Pages 795-803.